To give you a little edge to your performance when running or playing most sports, the best compression shorts are just the help you need. They can help improve blood flow, making your workout and recovery a little easier. We researched some of the top-selling and most popular compression shorts around to help you find just the right pair. Before we get to our compression shorts reviews, let’s look at some of the key features to keep in mind. Moisture-Wicking: When you sweat during a workout, it can make you feel really gross. Moisture-wicking material pulls sweat away from your skin and into the fabric. This will keep you cool and dry and more comfortable overall. Quick Dry: This goes hand in hand with moisture-wicking. Once the sweat is pulled into the fabric, it needs to evaporate quickly so it doesn’t continue to collect. Quick-drying fabric is essential to making sure this happens. UV Protection: UV protection is important if you’re planning to use these shorts to exercise outside, especially in the summer. UV rays can be really damaging to your skin so it’s best to have as much protection as possible. Pieces: Most of these are single pairs of compression shorts but we did find a few that came in packs of 3. Having multiple pairs is more of a convenience than anything else but comes in really handy on laundry day. Length: These shorts all have inseams that range from 6 to 9 inches. Choose whatever length you prefer. Keep in mind that, for tall people, longer might be better. And for short people, shorter might be better. 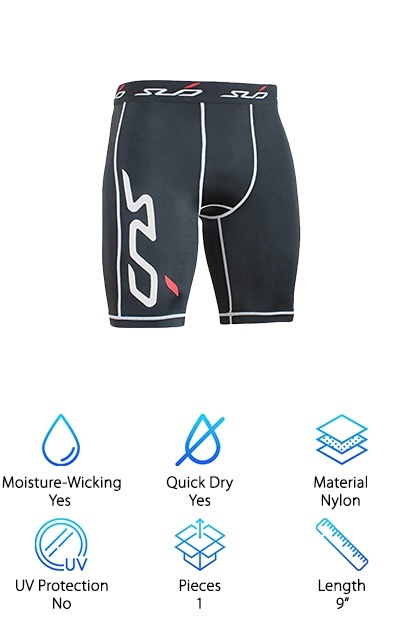 Now that you know some of the features to look for when you’re trying to find the best compression shorts, let’s get to our reviews. Running short on time? Start with the top 2 items on our list first. Those are our top pick and budget pick. You’ll get a nice idea of what is out there. If you can, stick around and read up on the rest of our picks, too! They’re all worth a closer look. Ok, let’s go! 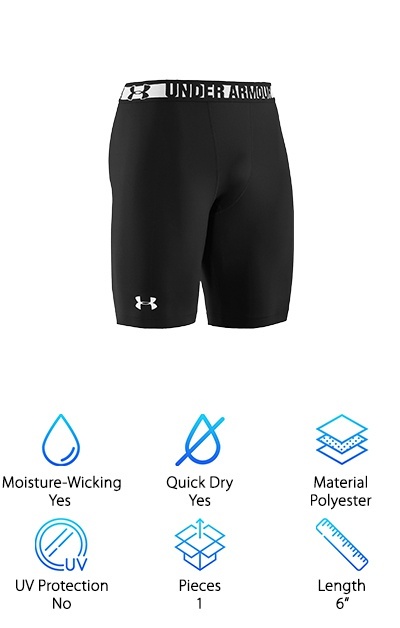 Our top pick for best men’s compression shorts is from Under Armour. These are actually made from new technology that Under Armour calls HeatGear Sonic. What should you expect from these shorts? Well, they have a really tight fit. In fact, they’re meant to wear like a second skin that will help you increase muscle power. It stretches 4 ways for a perfect fit and it will maintain its shape. It also has smooth, flat seams so nothing rubs. These shorts will keep you comfortable while you’re working out by wicking away any moisture and are quick drying, too. Staying dry is good for a few reasons. It keeps you cool and dry and also helps to prevent chafing. That’s not all. The anti-odor technology prevents microbes from growing help stop odors before they start. If you’re looking for the best cheap compression shorts, our budget pick is right up your alley. These shorts are from Champion. They’re mostly made of polyester but have some Spandex, too, in order to help them keep their snug fit. The flatlock seams are designed to lay against the skin without causing any rubbing or chafing. There’s more. You’ll stay dry thanks to the moisture-wicking technology that pulls it away from the skin. They’ll dry quickly, too, thanks to Champion Vapor technology and the targeted ventilation zones that let air flow to keep you cool and comfortable. One of the things we liked most about these shorts is that they’re machine washable so you can easily get rid of any odors. Oh, and there are 10 different colors for you to choose from. We’re calling these shorts from Tesla our best compression shorts for CrossFit. First of all, they provide great compression. There’s a little Spandex in the fabric to help it maintain its shape and give it extra elasticity. Something we really liked was how these pants were designed with breathability and ventilation in mind. They’ll help you feel cooler during your workouts. Plus, the moisture-wicking and quick dry capabilities help keep you from chafing and prevent odors from forming as quickly. The material is nice and comfortable, too. It’s non-abrasive and won’t cause you any problems plus it provides UV protection. It’s also made with a 3D geometric pattern that allows you to move freely. That’s not all. There are also 24 colors to choose from, including bright solids and even camo patterns. 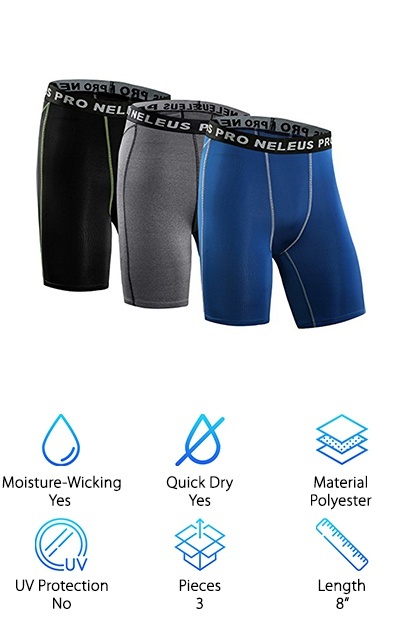 The Neleus Compression Shorts are mostly polyester but have just the right amount of Spandex to keep them nice and snug. It also helps them maintain their shape over time. That’s not all. They use a moisture transport system to pull any moisture away from your skin. They also dry fast which will help keep you cool and comfortable and prevent chafing. The four-way stretch allows you to move freely because the material can move in any direction that you do. 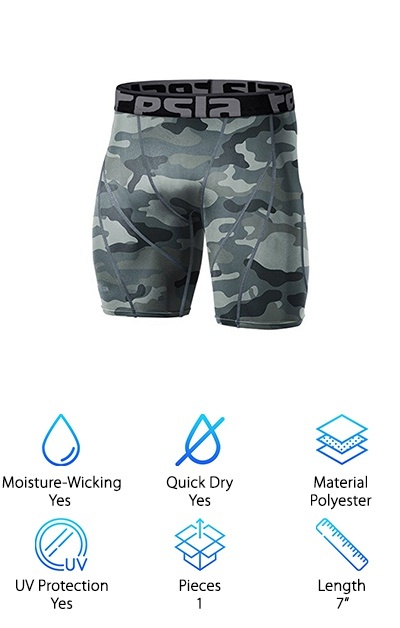 This is actually a 3 pack of shorts so you will definitely get a lot of use out of this product. They’re machine washable and come in a variety of colors. There are packs of standard colors like grey and black or you can mix it up with a pack that’s multicolored. 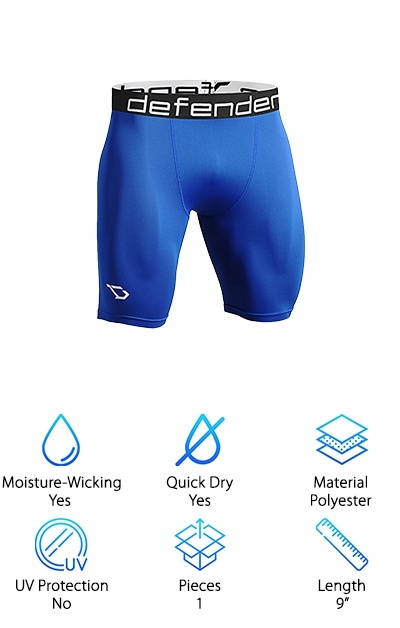 One of the things we liked about these compression shorts from Defender is that you can use them in hot or cold weather and they’ll still give you a lot of benefits. These all-weather pants will let your skin breathe in the summer and help retain heat in the winter. The machine washable fabric is smooth and ultra soft and won’t impede movement. 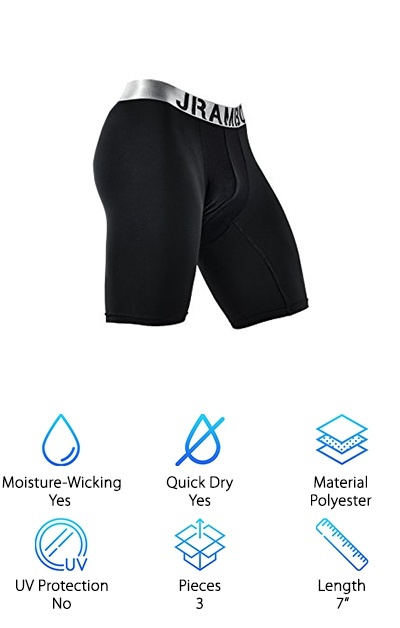 They wick sweat away from your body and dry really fast so you won’t have to worry about any moisture or the problems that come along with it. And get this: restriction is at a bare minimum. They won’t hold back your movements at all. We really like variety and were taken with how many different colors there are to choose from. There are 19 different colors, some are solid and some feature cool camo designs. 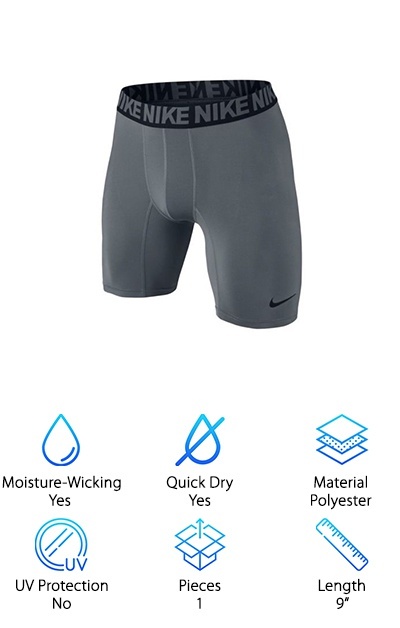 You already know that Nike is a huge name when it comes to sports so it’s not surprising that their Baselayer compression shorts made it to our top ten list. They give you just the right amount of compression while still allowing you to move freely. They’re also really comfortable. The waistband is wide and flat so it won’t dig into your skin while you’re working out. It also has flat seams so nothing will rub or distract you while you’re working out. And don’t worry about sweat. The moisture-wicking technology will pull it away from your skin. It evaporates quickly, leaving you cool and dry. These are available in 3 colors: black, grey, and white. Plus, it comes with the famous Nike swoosh on the leg and the brand name repeated around the waistband. 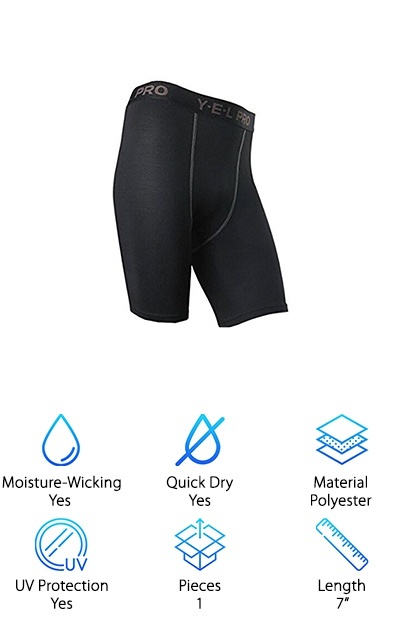 One of the things that make Royal Journey Compression shorts our pick for best compression shorts for running is that they provide UV protection. More specifically, they protect your skin from 99% of harmful UV light, which is perfect if you do most of your running outdoors. Of course, lots of other things come along with running outdoors, like sweat. No worries! These shirts are quick drying and moisture-wicking. They’ll pull all the moisture away from your body so you can stay comfortable and dry. Flatlock seams keep them snug against your skin without any rubbing. And here’s something you’ll really like: odor controlling technology. The special deodorization function eliminates odors left behind from sweat and dirt, yet another reason why these ones are so good for running. Especially outside! 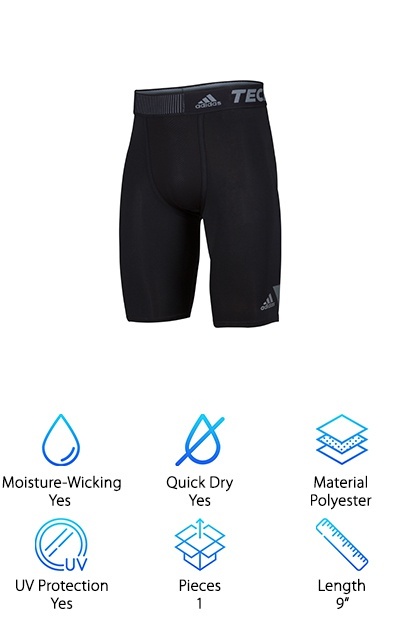 Adidas is another well-known brand so sports equipment and these Performance Techfit Shorts are just as high-quality as all their products. The 9-inch inseam is on the long side when it comes to these kind of shorts. That’s not good or bad, really. But if you’re particularly tall and have found some other brands are too short for you, these might be just what you were looking for. The lightweight fabric is moisture-wicking and quick drying. You’ll stay dry and have less chance of chafing because of it. Some of the seams are ultra soft while others are flatlock; either way, they shouldn’t cause you any discomfort. These pants are primarily made of polyester but do have Spandex to help keep their shape. Oh, and we can’t forget that these pants provide UV protection. Something that made these shorts stand out for us was the breathable mesh design on the front of these shorts. It lets air circulate better so you can stay cooler and more comfortable while working out. The fabric is soft and provides a 4-way stretch so they won’t inhibit your movement. They’re moisture-wicking and quick drying so you don’t need to worry about sweat. And get this: they have a no-ride-up design that will keep the legs from bunching while you run. They also have a wide, flat waistband that won’t dig in when you’re being active. This is a 3 pack which makes it really convenient as far as washing goes. Once one pair gets soiled you’ll already have another pair ready to go. And another one after that! These compression shorts from Sub Sports are a little heavier than the other products we included on this list. Technically, they’re classified as “midweight” so if you wanted something that felt a little more substantial, check this out. Even though it’s a little thicker, this fabric is still really awesome. It has 4-way stretch that moves with your body. 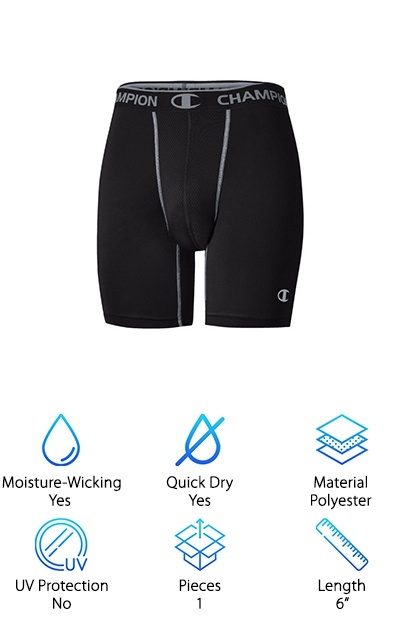 Plus, you can avoid chafing and rubbing thanks to the flatlock seams and moisture-wicking ability of these shorts. They’re made mostly of nylon but there’s some elastane mixed in, too, to keep them nice and snug. The compression targets muscle groups used in just about every sport which makes these a great choice to wear year round. Plus, they’re machine washable and easy to care for. Just wash them in cold water so they keep their shape.